Last week was cold. High of 2 degrees cold. So I had to do something to warm me up, to keep me from withering away during these bitter, winter months. So I made a tart. 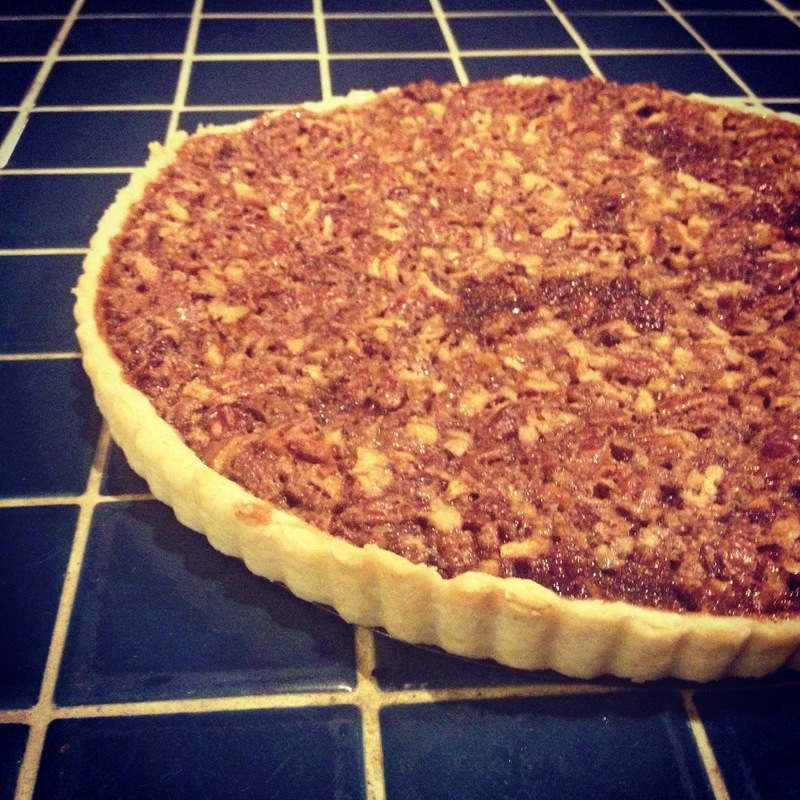 A maple pecan tart. And I think it's worked. As Danielle calls it, my tummy sweater has been keeping me toasty now for the last month. Sorry I'm not sorry. I found the recipe here and boy, oh boy is it good. Maple syrup replaces the gross and processed corn syrup in this recipe, giving it a lighter and crisper taste. Me likey. I also used my food processor for the first time (thanks for the awesome xmas present Gma!) to make the crust and the results were okay. It was easier to make the crust in the food processor (you just dump all the ingredients in and pulse), but I don't think the crust turned out as well as just doing it by hand (the butter became too incorporated with the food processor method; it's flakier when done by hand). And finally, although the original recipe was for a pie, the bf has no pie dish, so tart it became. The tart was good because it made the dessert stretch a little farther than a pie would have, meaning more slices for me. Pecan pie tart is quickly becoming a favorite dessert of mine. It is easy and quick to make, has less than ten ingredients and comes out perfectly every time. Try it, it's good, and so are tummy sweaters. Put water in a bowl with a couple of ice cubes. Set aside. Pulse flour, sugar and salt in food processor. Add the butter. Pulse until the butter is the size of peas. Add water, 1 tablespoon at a time until the dough begins to lump together. Remove the dough from the food processor and knead together gently with your hands until the dough becomes one lump. Wrap in plastic wrap and form into a disk. Chill in the fridge for at least one hour. After an hour, remove the dough from the fridge and roll out on a floured surface. Put into a tart (or pie) dish. Chill in the fridge. Preheat the oven to 350 and place rack at the lowest position. In a large bowl, beat the eggs. Add the syrup, brown sugar, melted butter and vanilla. Mix well. Add the chopped pecans. Remove the tart shell from the fridge and pour in the pecan mixture. Bake for 30-35 minutes. Allow to cool for at least 20 minutes and enjoy! superb situation such as this! Now you know that I has been appropriate. hahah! Thanks for the details anyone posting.